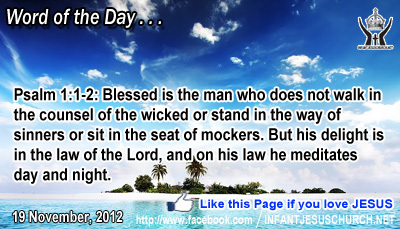 Psalm 1:1-2: Blessed is the man who does not walk in the counsel of the wicked or stand in the way of sinners or sit in the seat of mockers. But his delight is in the law of the Lord, and on his law he meditates day and night. Heavenly Father, just as you shaped such a beautiful world and put us together in our mother's womb, we also ask that you create in us a desire to know your truth and an insight in how to survive that truth. We know your Holy Spirit is in us to help us in this expedition of world, but we want so much to satisfy you and glorify you because of all the ways you have blessed us. In Infant Jesus' name we pray. Amen. 35 As he drew near to Jericho, a blind man was sitting by the roadside begging; 36 and hearing a multitude going by, he inquired what this meant. 37 They told him, "Jesus of Nazareth is passing by." 38 And he cried, "Jesus, Son of David, have mercy on me!" 39 And those who were in front rebuked him, telling him to be silent; but he cried out all the more, "Son of David, have mercy on me!" 40 And Jesus stopped, and commanded him to be brought to him; and when he came near, he asked him, 41 "What do you want me to do for you?" He said, "Lord, let me receive my sight." 42 And Jesus said to him, "Receive your sight; your faith has made you well." 43 And immediately he received his sight and followed him, glorifying God; and all the people, when they saw it, gave praise to God. This incident reveals amazing about how God interrelates with us. The blind man was determined to get Jesus' consideration and he was persistent in the face of opposition. Jesus could have unnoticed or rebuffed him because he was interrupting his talk and troubling his audience. Jesus showed that performing was more important than talking. This man was in desperate need and Jesus was ready not only to understand with his suffering but to relieve it as well. A speaker can command attention and respect, but a man or woman with a helping hand and a big heart is loved more. Jesus commends Bartimaeus for distinguishing who he is with the eyes of faith and grants him physical sight as well. Do we recognize your need for God's healing grace and do you search for Jesus, like Bartimaeus, with unrelenting faith and trust in his goodness and mercy? Bartimaeus was not only grateful for the gift of faith and the gift of physical sight, but for the occasion to now follow Jesus as one of his disciples. Luke tells us that he without delay followed Jesus and gave glory to God. The crowd also gave praise to God when they saw this dual miracle of spiritual and physical vision. Loving Infant Jesus, open the eyes of our heart and mind that we may see and appreciate the truth and goodness of your word. May we never fail to recognize your presence within us and to call upon your saving grace in our time of need and healing.